Pravasan Pillay continues his series of columns on sandwiches and this time he’s talking snackwiches. One evening, a few months ago, I was struck by a serious craving for a cheese and tomato snackwich. You know the kind with the molten burn-the-roof-your-mouth stringy cheese, crispy, slightly oily outsides – all bordered by pleasingly crunchy hard edges. Unfortunately, I don’t own a snackwich maker, so I had to improvise with my waffle iron. The result, while pleasant in a grilled cheese or panini kind of way, was nowhere near as satisfying as a toasted sandwich made in a genuine snackwich maker. I think the important difference is that the waffle iron compresses the two slices of bread together while a snackwich maker creates a sealed pocket between the slices. The reason I bring this up is because while eating my pathetic, waffle-imprinted toasted cheese and tomato sandwich it struck me for the first time what an odd – though admittedly cute – word ‘snackwich’ was. And this comes after 38 years of eating them. 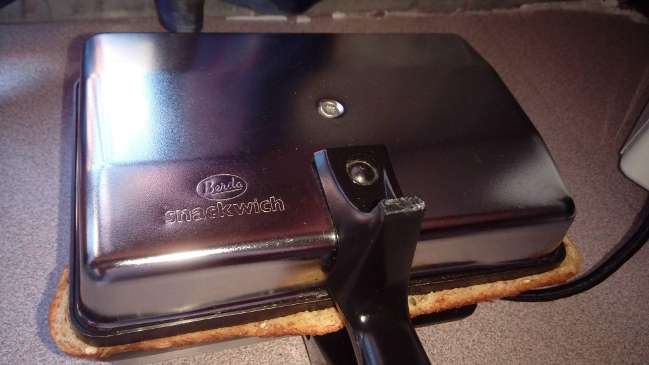 My wife, who is Swedish, had never heard of the word before she visited South Africa, even though they have identical toasted sandwich makers in Sweden. It got me wondering if it was an exclusively South African term. Or perhaps restricted to the Southern Hemisphere or the Commonwealth. I knew that there was/is a brand of sandwich makers called Snackwich so this might have been a case of adopting a popular brand name to refer to a generic item, e.g. Kleenex for tissues, Hoover for vacuum, or Telkom for incompetence. If it was an exclusively South African word, then my next question was whether its usage was spread across all cultures, races, and regions. I conducted an intense ten minutes of research online and the majority of hits I encountered were South African websites. Wikitionary cited South African writers Ashraf Jamal and Zinaid Meeran. Jamal and Meeran are both of Indian descent as far as I know, so then I began wondering if the word was predominantly used by South African Indians, like calling soft drink “mineral.” I could say with 99 percent certainty that all the SA Indians I know use the word ‘snackwich’ but to be honest, I had no idea about the other races in South Africa. I suppose this is just the reality of growing up in a divided country, where despite all the hollow hype of the Rainbow Nation, we are still essentially strangers to each other. And even when we begin to think we know each other, strange little glitches like this pop up and dissuade us of that notion. I live in Sweden now and I guess the fractured nature of South African national culture is amplified for me when compared to the homogeneous culture here. There was talk of nostalgia, craving snackwiches and I mentioned my habit of making them with leftover curry as a filling. By that point, I had lost interest in finding out for sure whether ‘snackwich’ was a purely South African word. It was just comforting to find a tiny thread in the shape of a weird word that connected me to my friends, my fellow South Africans. This column is part of a series on sandwiches that Pravasan Pillay is writing for The Con. Read “The Special Sandwich”, “On the Chip Sandwich” and Cold Toast.